The Book of Mormon introduces Sariah, Lehi’s wife and Nephi’s mother, in 1 Nephi 2. Sariah is mentioned by name four times (1 Nephi 2:5; 5:1, 6; 8:14). As one of the few named women in the Book of Mormon, Sariah’s character and role in the narrative has garnered considerable attention by readers. [i] Beautifully, the name Sariah means “Yahweh is prince” and would’ve been pronounced either sar-yah or sar-yahu in ancient Hebrew. “The Hebrew name Sariah, spelled sryh, has been identified in a reconstructed form as the name of a Jewish woman living at Elephantine in Upper Egypt during the fifth century B.C,” Chadwick noted. While the name (or an English variant thereof) was only attested in the Bible as a masculine name, the discovery of the Elephantine papyri firmly demonstrates that “Sariah” is an authentic Hebrew feminine name. The Book of Mormon has been vindicated in two major ways with this evidence. First, it has been vindicated in its use of Sariah as a personal Semitic name shortly before and after the Jewish exile of the 6th century BC. Second, and more importantly, the Book of Mormon has been vindicated in presenting Sariah as a feminine personal name. “That we can now identify . . . the Jewish/Hebrew name Sariah in the Elephantine Papyri,” Chadwick concludes, “represents [a] significant step forward in corroborating the authenticity of [a] heretofore unique Book of Mormon name.”[vi] That this evidence was only available long after Joseph Smith published the Book of Mormon makes this corroboration all the more convincing. The Book of Mormon Onomasticon project is dedicated to looking at “the proper names in the Book of Mormon” in order to provide a “unique and useful tool for the study of the peoples of that book and make possible new insights for understanding” the text. The project has a discussion of the name Sariah at https://onoma.lib.byu.edu/onoma/index.php/SARIAH. Jeffrey R. Chadwick, “Lehi in the Samaria Papyri and on an Ostracon from the Shore of the Red Sea,” Journal of the Book of Mormon and Other Restoration Scripture 19, no. 1 (2010): 14–21. Camille Fronk, “Desert Epiphany: Sariah and the Women in 1 Nephi,” Journal of Book of Mormon Studies 9, no.2 (2000): 4–15, 80. Jeffrey R. Chadwick, “The Names Lehi and Sariah—Language and Meaning,” Journal of Book of Mormon Studies 9, no. 1 (2000): 32–34, 77. John A. Tvedtnes, John Gee, and Matthew Roper, “Book of Mormon Names Attested in Ancient Hebrew Inscriptions,” Journal of Book of Mormon Studies 9, no. 1 (2000): 40–51, 78–79. Jeffrey R. Chadwick, “Notes and Communications: Sariah in the Elephantine Papyri,” Journal of Book of Mormon Studies 2, no. 2 (1993): 196–200. [i] See for example Camille Fronk. 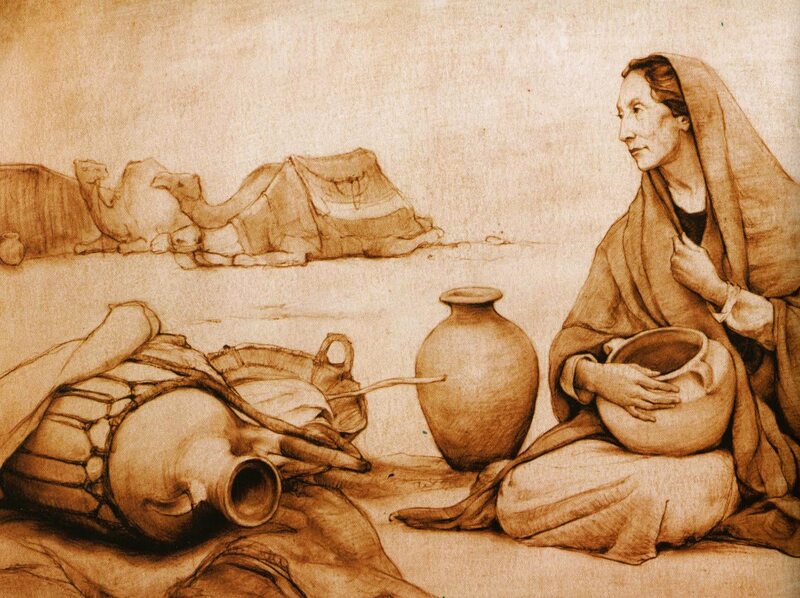 “Desert Epiphany: Sariah and the Women in 1 Nephi,” Journal of Book of Mormon Studies 9, no. 2 (2000): 4–15, 80; Grant Hardy, Understanding the Book of Mormon: A Reader’s Guide (New York, N.Y.: Oxford University Press, 2010), 21–23. [ii] Jeffrey R. Chadwick, “Notes and Communications: Sariah in the Elephantine Papyri,” Journal of Book of Mormon Studies 2, no. 2 (1993): 196–200; “The Names Lehi and Sariah—Language and Meaning,” Journal of Book of Mormon Studies 9, no. 1 (2000): 32–34, 77; John A. Tvedtnes, John Gee, and Matthew Roper, “Book of Mormon Names Attested in Ancient Hebrew Inscriptions,” Journal of Book of Mormon Studies 9, no. 1 (2000): 40–51, 78–79, esp. 43. See also Jeffrey R. Chadwick, “Lehi in the Samaria Papyri and on an Ostracon from the Shore of the Red Sea,” Journal of the Book of Mormon and Other Restoration Scripture 19, no. 1 (2010): 14–21. [iii] Chadwick, “The Names Lehi and Sariah—Language and Meaning,” 34. [iv] Chadwick, “Sariah in the Elephantine Papyri,” 198. [v] Tvedtnes, Gee, and Roper, “Book of Mormon Names Attested in Ancient Hebrew Inscriptions,” 43. [vi] Chadwick, “Lehi in the Samaria Papyri and on an Ostracon from the Shore of the Red Sea,” 20, original in plural.